Casa de dos habitaciones en el piso principal de Anglemont, BC, en el lago North Shuswap. A poca distancia de una playa rocosa. Provincial playa de arena sólo un par de minutos en coche. Cerca del puerto deportivo, campo de golf, tiendas de conveniencia, gasolinera, bodega, y alquiler de embarcaciones. Hay una gran cantidad de actividades de verano, como rafting, golf, tirolesa, senderismo, natación, navegación, etc. En el invierno hay esquí de fondo, patinaje sobre hielo al aire libre y la zona es conocida por su moto de nieve. La casa ha sido recientemente renovado y cuenta con 2 dormitorios. Un dormitorio tiene una reina y una cama individual y el otro dormitorio tiene una cama de matrimonio (5 plazas cómodamente). Hay una bonita sala de estar y comedor, cocina, lavadero, baño y barbacoa al aire libre y zona de fogatas (se pueden aplicar restricciones de fuego). Podrá disfrutar de los 900 pies cuadrados de espacio. Paseos en barco a la tienda y restaurante flotante o simplemente un viaje escénico se pueden arreglar. This rental property is wonderful with everything you need. Beautifully done with kitchen that has everthing we needed to cook big dinners and such comfortable beds after an amazing day of sledding on Crowfoot Mountain. 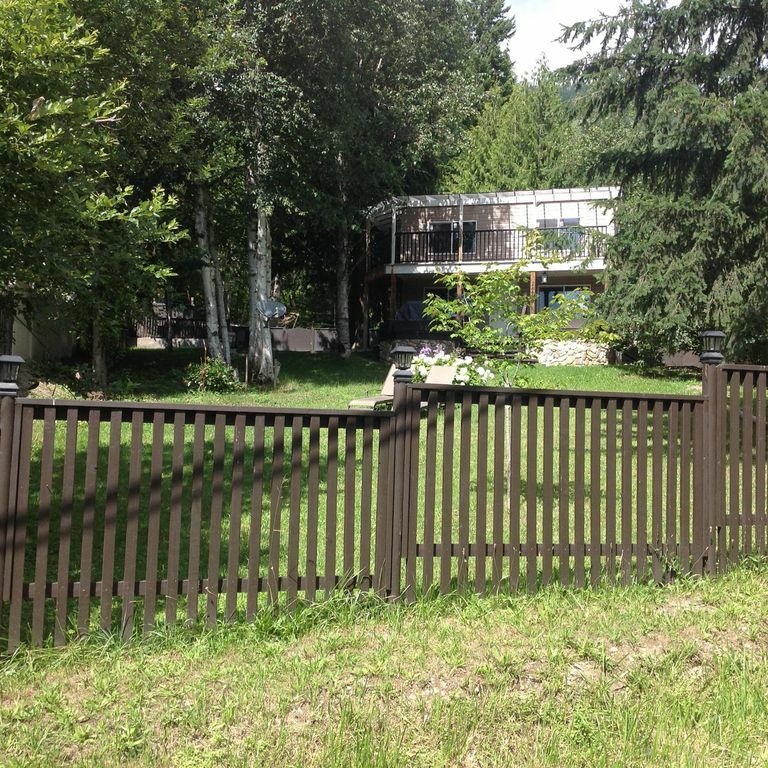 This property is a mere 10 minute drive to access the snowmobiling club or if your just out for the day. We also enjoyed ice skating on an nearby outdoor rink with free rentals. Love the North Shuswap !!! A Thanks to Sandra who was helpful and full of ideas of things to do. First of all, a great big thank you to the property owners for their kindness and for allowing us to stay at this location. The living quarters were very roomy and nicely furnished. My wife and I enjoyed the peacefulness here, even through having a power outage after a big storm went through. If you don't care about being near the beach and you like to walk (hills included), then this is the place for you. We had no negatives about the place or location because we were here to visit relatives and even they were nice (LOL). Pros: Sandra was amazing to deal with. So quick to respond & full of suggestions of things to do. Her place is lovely, clean, quiet: just needs a few basic items that would complete the kitchen/cooking. We loved the shower & the big BBQ! The neighbor Gina is a delight! Brought over a loaf of banana bread one morning made fresh! It was delicious! Cons: I was under the impression there was a beach within walking distance. The area pointed out was unappealing with old tables falling apart so we went there to skip rocks only. As well as being able to ride our bikes... This was not the case as the cabin is high up on a hill. I, myself would not ride it let alone my 5yr old. People drive much to fast to feel safe on the roads as well. Overall: I loved the lake but HIGHLY suggest water shoes as its rocky everywhere. Cabin itself: Great for quiet. Better for adults/teens. If you want to park your car for your stay it's not the ideal place. If it was lake front I'd stay there again. Thank you for your review. We strive for continuous improvement and your comments will help us make the Shuswap experience that much better for future guests. We do acknowledge that you may have had high expectations for the beach at the end of the road. It is not a public park and therefore a quiet beach for locals. It is 500meters from the house and is ideal if you want to launch a kayak, canoe etc. It is however a rocky beach and water shoes would make it more comfortable. There is a sandy beach a couple of minutes by car if that is what you are looking for. None of our other guests had an issue with the driveway but I can understand that someone with a high end vehicle may prefer a better driveway. We have put improvements to the driveway in our future plans. Again thank you for taking the time to comment and I hope you consider staying again.